If I had to guess I’d say it was Michael Ruhlman who once said – and I am paraphrasing here – that no matter where you live in the world, preparing dinner starts with chopping an onion. I believe he was making the point that if you’re going to do something before nearly every meal you cook in your life, you might as well learn to do it properly, efficiently. Knife skills, you know? Regardless of who said it, what was actually said and what the person – Ruhlman or not – meant by the remark, something very similar could be said for garlic. Indian, Thai, Mexican, Italian, whatever; you’re going to chop some garlic. Last night I pureed four cloves with Aleppo pepper, salt and sugar and rubbed it on a giant pork shoulder. The above photo was the next day’s result (click the photo to see the drool-inducing hi-res version. Really, I’ll wait). So, we go through a fair amount of it in our house. And if you cook at all at home, you know you do too. But the fact is that much of our garlic is grown half a world away in China. Truth be told, it gets the job done and it’s definitely cheap. But you can never be sure what went into producing that bulb and chances are, it’s on the downhill side of fresh anyway. There is a solution – especially if you’re disinclined to grow it yourself. Eric and Joanna Reuter grow a dozen varieties of garlic. They don’t operate a CSA anymore so the best way to get the goods is to stop into World Harvest, which recently began carrying a bin of their garlic options. Five will be available at any given time. And so the other day I picked up a couple of heads of each variety, which they have helpfully labeled and provided descriptions for. A quick scan of the posted QR code will take you to more information. For the aforementioned pork shoulder I used a head of their “Tochliavri” variety. The cloves were markedly different that the other stuff I have in the pantry. Firm and obviously fresh, they released a pleasant garlic aroma into the air – and garlic juice on the cutting board – when bashed with the side of my knife. Peeling was a snap and into the food processor they went, giving way to deliciously garlic-scented pork shoulder the next day. And while it turned out great, other applications like roasting whole heads, stirring into salsas or working into garlic butter would highlight fresh, homegrown garlic’s superiority to an even greater degree. So check out the Reuters’ handy usage guide and pick a few up at World Harvest the next time you’re in the area. I guarantee you’ll be able to tell the difference. 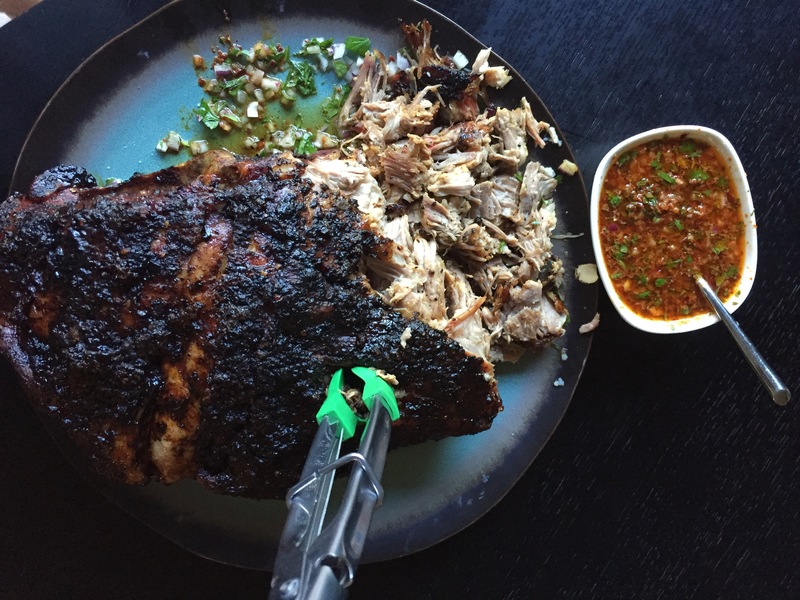 The pork shoulder recipe came from Bon Appetit (and was as tasty as it looks). You called it a pork loin in the beginning and a shoulder in the end. I can’t decide what is looks like other than delicious. I imagine it is a shoulder though because seven hours in the oven would be pretty hard on a loin. Adding this to my bucket list though. Thanks Monty. That was dumb of me. It is of course, pork shoulder. YES! I love garlic, and one of my greatest discoveries was buying garlic from some farmers who experimented with all different varieties one year. I was especially fond of German red varieties. I planted some cloves, but moved before I could harvest. Really should get on that again. Anyway, now I can get fresh garlic from the Root Cellar in Jeff City, and the difference is incredible.